"Daycare Diaries: Unlocking the Secrets and Dispelling Myths Through True Stories of Daycare Experiences" is an inside look at the daycare industry. Tell us a bit about your background in the daycare field. Rita opened her first (and only) daycare center licensed for 90 children back in November of 2000. She had no prior experience in daycare, and enrolled in a child development course and earned her degree in early childhood education one month after opening her center. She has been operating her daycare center ever since for the past 15 years with a crew of 14 amazing staff members passionate about working with children. Rebecca began her daycare career in 1992 when she had her first child and began working in a daycare center. She worked as a teacher for several years and eventually became an assistant director and director of the center. She then opened her own home daycare which she ran for 16 years and now works as the marketing director at the Pumpkin Patch in Burnsville MN. What first got you interested in becoming a daycare provider? When Rita enrolled her first child at the age of 2 into a daycare center, she was less than pleased with the experience she and her daughter received. It was not the experience she envisioned it would be, nor was it what she had been promised during the tour. Wanting to provide children and families the type of daycare experience she had envisioned and didn’t feel existed, she decided to open her own. Rebecca loved the fact that she could have a rewarding career teaching young children but still be close to her own 7 children and not feel like she was missing out on seeing them grow up. "Daycare Diaries" takes it’s readers through the doors of home daycares and childcare centers to provide an inside peek into the daycare world that few ever get to see. Through a unique collection of true daycare stories, parents will gain an inside perspective to a multitude of children’s daycare experiences which will leave them feeling enlightened and prepared to help make their child’s daycare experience a success. Each unique story will leave readers laughing, crying and questioning what they thought they knew about daycare as they turn the pages wanting more. We think providers and parents alike would most appreciate this book. For the providers, it validates their chosen profession which very often accompanies little to no gratitude. For the parents, it gives them insight to an entire world they know so little about. They will get to know all the hard work that goes into this field, their part in maintaining a successful daycare experience, all the benefits a great program can offer and also the red flags to avoid that might indicate an inadequate provider. What inspired you to write a behind-the-scenes peek into the daycare world? With our 30 years of combined experience in the daycare field, running a home daycare and a daycare center, we would naturally talk about daycare whenever we would get together. Through our discussions, we found that parents were truly unaware of what encompassed their children’s busy days at daycare. We were also concerned with the growing number of tragedies that were occurring by daycare providers that weren’t operating at a quality level. We wanted to bring attention and appreciation to the providers that are passionate about working with children, as well as warn parents about the ones that may be in the wrong field, possibly causing more harm than good. Your book contains an eclectic mix of stories Your book contains an eclectic mix of stories from the humorous to the surprising to the informative. When you were first getting into the daycare field, did you expect it to be so eventful? When Rita started her own daycare, she wanted to offer a family-friendly environment with an emphasis on good nutrition and learning. She believed at the time every childcare provider had chosen this field of work due to their passion for working with kids. She was genuinely surprised at the realization that not all providers had the best interest at heart for the children they cared for. As far as all the crazy events involving children and parents, no one could have predicted how colorful the daycare world can get. Sometimes it’s the parents that are harder to teach and to work with than the kids! Rebecca was very shocked and surprised by the tiny little world of daycare that she had never experienced as a child. The realization quickly hit that if she had no idea what actually went on in daycares than parents that are making important daycare decisions probably didn't either. We believe readers will truly be enlightened about the many aspects of the daycare world that will leave them appreciating their child’s experience that much more. Many believe daycare providers are just babysitters, and through these stories readers will learn how much more providers really are to the children they care for each day. In realizing the impact a provider has on a child, it will make parents more cautious about the person or center they are choosing to care for their child and make them less likely to make a hasty daycare decision that could be made for the wrong reasons. We both love empowering women, as we are both full time moms and work full time outside the home as well. Our next project may be a different aspect of life that we will use to bring inspiration and hope to women that they are more than just the titles they have become. What do you think are some of the biggest misconceptions people have about daycares? Their kids will get sick all the time. Their kids won’t be loved and treated as they would at home. If they let someone else care for their child, they aren’t good parents. Daycare is a place where kids don’t want to go and are better off at home. Kids cry all day, get ignored and just wait for their parents to pick them up at the end of the day. Home daycares are not as safe as daycare centers. Many of these misconceptions could be both true and/or untrue depending on the provider that is chosen. Do you have any advice for people beginning to look for a daycare for their child? Asking the right questions, followed up with frequent visits and spending some extra time with the provider they are considering, will give them a better idea whether they are making a good choice. All providers should have an open door policy to allow parents to visit as often and as long as they please. Get to really know the person being entrusted to the care of your child. This is the person that may be spending more time with your child during the week than you will. It should be someone you genuinely like and feel at ease to approach and talk with. Parents should feel like their children’s daycare is their second home-away-from-home for both their child and themselves, and ultimately they should have a positive feeling from both the provider and the environment. 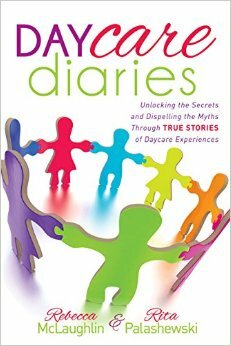 Trust their instincts, address any and all concerns immediately and read "Daycare Diaries!" Is there anything else you'd like potential readers to know about "Daycare Diaries"? When a parent is ready to hand their child over to a complete stranger, it is one of the scariest things they will ever have to do. Our goal in writing this book was to provide parents a tour guide to help them navigate the daycare world, and to know enough to make an educated daycare choice. As unfortunate as it is, the fact remains that there will always be providers who should not be working with children, and since we can’t stop them from being providers, we hope to deter parents from choosing the wrong providers. If we save even one life because a parent read our book and made a different choice, then we accomplished our goal. We really want parents to also have hope and through reading all the positive stories, be assured that choosing the right childcare can ultimately be a great experience for their children.